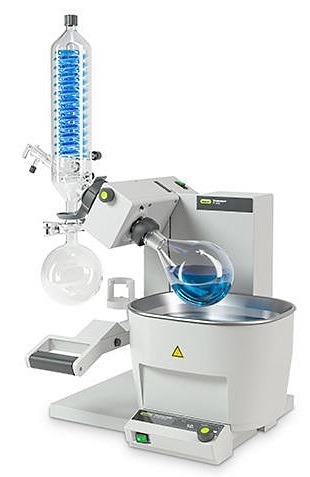 The Büchi R-300 rotary evaporator meets the highest expectations in convenience and versatility. Its modular design allows extensions of the R-300 to a fully integrated system in which a central interface regulates each component. It replaces the former Büchi R-210 model. 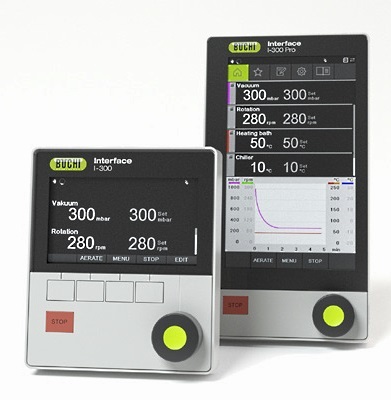 With the I-300 or I-300 Pro interface the R-300 replaces the former R-215. 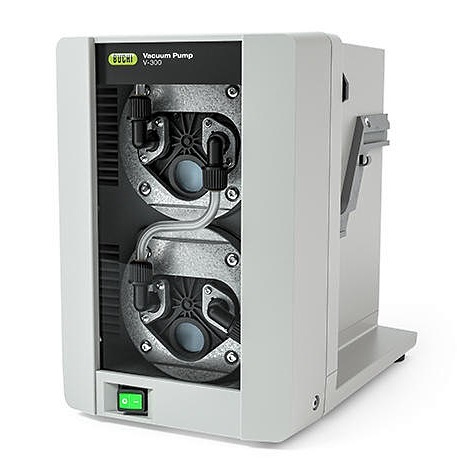 The R-300 Rotavapor can be purchased with either a V-type Vertical Condenser, a C-type Dry-Ice Condenser, an A-type Diagonal Condenser or an S-type Vertical Reflux Condenser. The V-type or vertical condenser is the most common for standard applications and has a surface area of 1460 cm2. The C-type or Dry-Ice Condenser is ideally suited for the distillation of solvents with low boiling points and has a surface area of 500 cm2. The R-300 is available with a choice of two heating baths for exacting applications. 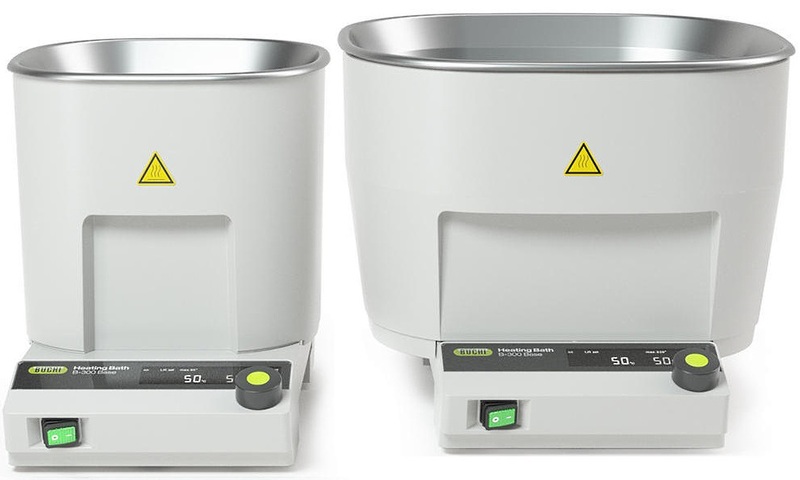 The B-301 is a classical water bath that quickly goes up to 95ºC (4 minutes to reach 50ºC) and accommodates up to a 1 liter evaporation flask and the versatile B-305 heating (water or oil) bath goes up to a maximum temperature of 220ºC (8 minutes to 50ºC) and accommodates evaporating flasks up to 5 liters in size. The Büchi Recirculating Chillers F-305 and F-308 are environmentally friendly and water saving labora¬tory devices to cool a lab size rotary evaporator. 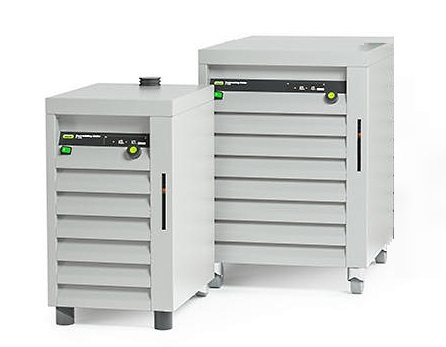 They features a range of -10 °C to +25 °C, but differ in their cooling capacity. The Büchi V-300 PTFE Diaphragm Vacuum Pump is a quiet and ideal companion to the Rotavapor R-300. Combining a basic R-300 rotary evaporator with either the I-300 Interface or I-300 Pro Interface allows the digital display of speed and vapor temperature, and the ability to remotely control rotation speed, bath temperature and vacuum regulation. Büchi rotary evaporators can be configured in many ways, to suit individual needs and budgets. Examples are given in the ordering information.